Which have been your favourite band reunions? The communal celebration of a band’s legacy, the return of a classic sound and unforgettable songs, the emotional resonance of seeing members sharing a stage again after many years apart; there can be something very,very special about reunion gigs of your favourite bands. As the reunited line-up of Ozzy, Geezer and Tony prepare to play their final Black Sabbath show I look back on some pretty special band reunions. In no particular order, here are seven spectacular reunions I’ve been lucky enough to witness in recent years. 1. Black Sabbath 2014 and 2017 – Truly one of the great reunions of modern times, even without original drummer Bill Ward. Back in 2014 when Sabbath played Hyde Park I wrote ‘Osbourne’s ups and downs have certainly been well-documented and Iommi has been undergoing debilitating bouts of chemotherapy over the past two years. All of that is a world away from tonight’s performance, however, and the band members are all blisteringly on form. They commence with a stunning version of War Pigs and one by one the classics are reeled off: Snowblind, Fairies Wear Boots, Iron Man. The sound is great. The guitars, drums and vocals are everything you would want at a Sabbath gig.’ When dates were announced for The End tour I had zero hesitation in snapping up a ticket. Reviews from 2014 here and from 2017 here. 2. Status Quo ‘Frantic Four’ 2013 and 2014 – Although Status Quo continued to fill arenas each year, there was something very special and very emotional about seeing the classic ‘frantic four’ line-up of Alan Lancaster, John Coghlan, Rick Parfitt and Francis Rossi walk on stage at the Hammersmith Apollo after a 32-year absence. The earthy, rocky, bluesy brand of boogie they played that night was quite different from the keyboard-heavy pop-rock act that normally tours under the Quo banner these days and the crowd were absolutely ecstatic. Sadly, following the tragic death of Rick Parfitt, it’s something that can never be repeated now, but I was lucky enough to see them on both the original reunion tour in 2013 and the follow-up a year later. Here’s my review from 2014. 3. Mott The Hoople 2009 and 2013 – I have loved Mott The Hoople ever since discovering one of their albums second-hand as teenager in the early 80s. And although I’d seen Ian Hunter solo before I was amazed to open the Guardian guide one Saturday morning and see an advert for a Mott The Hoople reunion at the Hammersmith Apollo with all the original members, 35 years after the bands demise. Although alzheimer’s was beginning to take its toll on drummer Dale Griffin he joined the band for the encores in 2009. Hugely emotional, it was a glorious celebration of a criminally under-rated band and remains one of my favourite gigs of all time and remains a text-book case of how to pull off a reunion with dignity, style, emotion and meaning. I saw the band again at the O2 when the reunion (sans Griffin) was repeated four years later. The sad deaths of both Dale Griffin and bass-player Overend Watts in the past year remind us how privileged Mott fans were to get their long-awaited reunion when they did. 4. Beach Boys 2012– While I’d seen a couple of stunning solo shows from Brian Wilson, I’d never been at all tempted by the Mike Love-fronted band that continued to tour under the Beach Boys name. But when it was announced that the surviving Beach Boys (Brian Wilson, Mike Love, Al Jardine, Bruce Johnston and David Marks) would be re-uniting to celebrate the band’s fiftieth anniversary I snapped up tickets for friends and family as soon as they went on sale. A mega run-through of Beach Boys hits, a gloriously full sound (aided by musicians from Brian Wilson’s musically brilliant touring band) and a beautifully authentic-sounding new studio album, too, this was definitely a reunion not to be missed. Al Jardine’s voice was particularly outstanding still. 5. Blur 2009 and 2015 – Blur’s Hyde Park reunions have become something of a tradition. I saw the first in 2009 and although I missed the one for the 2012 Olympics I did see them again in 2015. 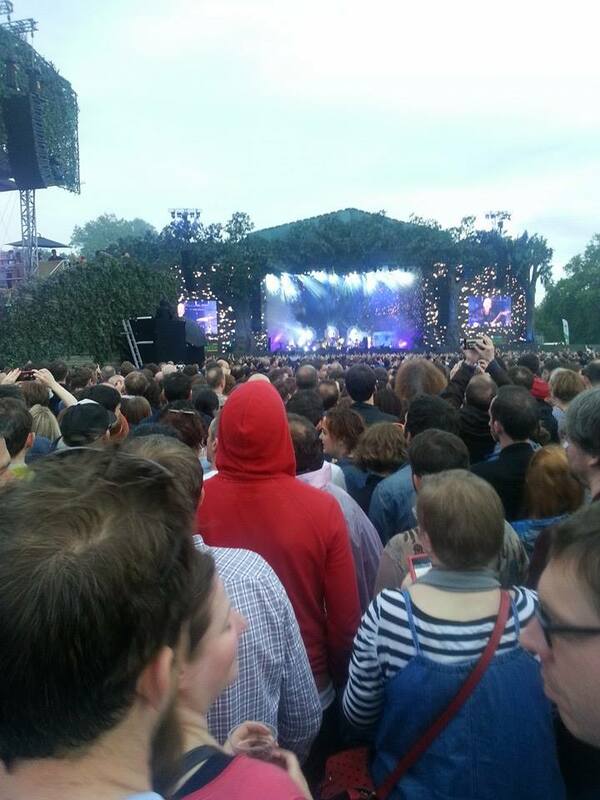 ‘The crowd is hugely good natured and it’s very much a communal celebration in Hyde Park. These songs have stood the test of time and are rightly held in great affection, as are the band who play them’ is what I wrote at the time. My full review from 2015 here. 6. Fotheringay 2015 – ‘Sandy Denny was the finest British female singer-songwriter that ever lived. Fotheringay was the short-lived band she formed in 1970 on leaving Fairport Convention. It lasted less than a year, but forty-five years on the surviving members have reformed for a short tour and are playing their first London gig since 1970. Band reunions can elicit mixed reactions and some questions went through my mind on this one. However talented the remaining musicians are, would this be a worthwhile exercise with the band’s two main front-people, Sandy Denny and her husband Trevor Lucas, long since deceased? As soon as the band come on stage, though, and open with Nothing More, the opening number on the original Fotheringay album, all doubts are set aside.’ Full review here. 7. The Kinks (well Ray and Dave) 2015 – Who knows if there’ll ever be a Kinks reunion. I did, however, catch a solo gig of Dave Davies in Islington back in 2015 with a very nice surprise at the end. Here’s what I wrote at the time: ‘Of course, when he came back on for an encore we could all guess absolutely what the song was going to be. What we couldn’t guess, though, was who would be joining him for that final song. “A surprise for Christmas!” announced Dave and on walked his brother Ray, the two of them sharing a stage together for the first time in 19 years. The audience as one are hit with amazement and wonderment at this beautiful and unexpected moment in rock’n’ roll history. Ray was in fine voice as he sang You Really Got Me and Dave cranked up the guitar. The audience went wild. Excitement, joy and genuine emotion as that 2 minutes and 14 seconds of one of the greatest rock’n’roll songs of all time blasted out from the stage.’ Full review here. Of course, there are some band reunions I would love to see if ever they were so inclined (Gillan, Supergrass, the surviving members of the Byrds) and there is one I would have loved to have seen happen more than anything (Slade) but the possibility of that seems ever more remote with each passing year. However, I do feel genuinely lucky to be present at each of those moments described above. Which have been your favourite musical reunions and which bands would you like to see re-unite? To say that much of the music of the 80s left me cold is something of an understatement. Even though it was the era I came of age in, exploring music and bands of earlier decades held much more appeal. But when Blur and Britpop appeared my appetite for new music and new bands was dramatically awakened, like hitting a second bout of teenager-dom. I’d just started Uni in my late 20s as a mature student and Parklife was rarely off the juke box in the Goldsmiths college bar in 94.